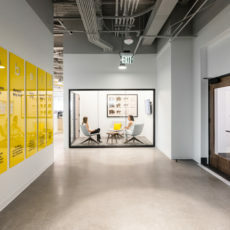 Rather than an insurance company that uses technology, Dental Select is shifting the paradigm—evolving into a technology company that specializes in dental insurance. 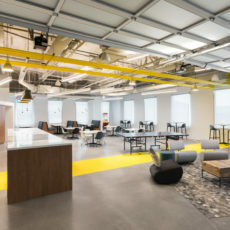 Company leaders recognized the need to create a workspace where innovation could be fostered. 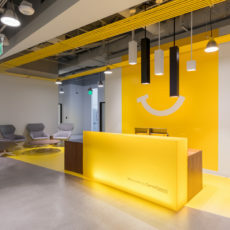 Employees and visitors are greeted by bold, brand-yellow, a cheerful smiling logo, and a bright, airy, open workspace. 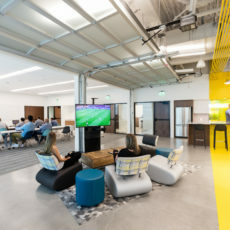 At 24,000 square feet, occupying a single floor, employees have many opportunities to interact in public areas, six huddle rooms, four conference rooms, breakout spaces, and a flexible training room adjacent to the communal kitchen. 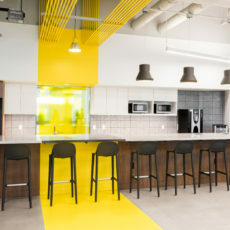 Heads-down work is carried out on height adjustable desks at ninety workstations and twelve private offices. 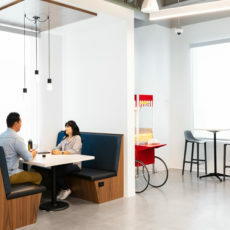 The workspace supports company goals and is a place employees genuinely enjoy going to each day.